Jewish History: The famous Russian air hero, General Shmushkovitch, was a native Rakishoker, the son of Gerson Shmushkovitch. Just before the outbreak of war with Germany, he moved his entire family from Rakishok to Moscow, including his brother Elozor, who was learning in the Slobodka Yeshiva. Economy: The Jews occupied themselves with retail shops, small trading, leather production, peddling in the surrounding villages, handicrafts, manufacturing, and exporting grain and flax. Institutions: Rakishok's uniqueness lay it its large Chassidic population. They were "heise" (fervent in Yiddish) Lubavitch Chassidim, with their own rabbi and shochetim. And this in a Lithuania whose cities and towns were decidedly not Chassidic. Rakishok arranged for the Lubavitcher Rebbi to visit Rakishok after he escaped from Russia and settled in Riga, Latvia's capital in 1915. Rakishok was proud that the Rebbi chose to stay there when he visited no other Lithuanian town or city, not even the large city of Kovno. Rakishok's Jews were dedicated Torah Jews. Reb Bertchik Zalkind, a somewhat scholarly Jew, founded a yeshiva in Rakishok. Not only Rakishok boys studied there but also students from the nearby towns - Kamei, Fonedel, Abel, and Shvadost. The 60 students were taught by Rav Moshe Sidrer and the martyred Rav Mechel Veiner. Mr. Zalkind undertook to maintain the yeshiva students and the roshei yeshiva. Zalkind himself taught a daily shiur in the Mittelste Synagogue. Many Rakishok boys studied in major yeshivos out of town, and some of them became renowned authorities. One of those was the martyred gaon Rav Zelik Ruch, who became rosh yeshiva in the Lomza Yeshiva. Spiritual Leaders: Among the town's rabbis over the years were: Rav Eliyohu Margoliyos; Rav Isser Margoliyos; the martyred Rav Betzalel Katz, rabbi of the Chassidim for many years until the Holocaust; Rav Yitzchok Gorr, who settled in Hebron, Israel and died there; Rav Shmuel Leviton, who settled in New York where he died in 1974 at the age of 91; the martyred Rav Avrohom Meirovitz; and the last rabbi of the misnagdim, the martyred Rav Zelig Arlovitz, a native of Rakishok, who overcame the handicap of "I remember him as a boy" to become the town rabbi. Another native of Rakishok, Rav Shmuel Abba Snieg, served as a chaplain in the Lithuanian army. He survived the war and became the rabbi of post-war Munich, Germany. 1939-1945: During the early days of the war, Rakishok filled up with refugees for the surrounding towns - Skopishok, Kupishok, Kamei, Vishinta, Fonedel, and others - all seeking to cross the Latvian border into Shebezh. But the Germans were faster than them and occupied Dvinsk, thus blocking that escape route. A few people managed to escape into Russia by train. On June 25, 1941, the Germans occupied Rakishok. 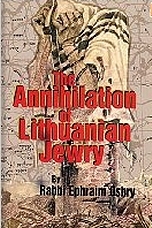 The day before, the Lithuanian fifth column began to beat and rob the Jews along the roads where they were desperately trying to escape by horse and wagon. Refugees whom the local Lithuanians pointed out to the Germans were warned to return home, but were murdered en route. The local Jews were driven out of their homes and forced into synagogues and houses of study. Several weeks later the men were separated from their wives and children, and marched out of town to dig their own graves before being murdered. A few weeks after that nearly all the women and children were killed. A few women somehow survived, among them Rochela Zhager and Mrs. Zokenstein.